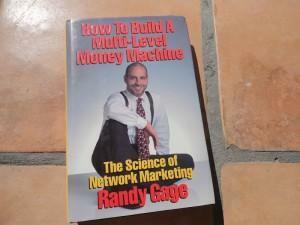 In today’s post, I’m going to do a book review of How to Build a Multi-Level Money Machine by Randy Gage. I’m a huge fan of Randy Gage. In fact, he is one of my favorite mentors in the network marketing industry. He’s a guy who has been there and done that and earned millions in our industry. He is a respected trainer, consultant, speaker, coach, author, and network marketing distributor. He’s also a pretty cool dude! I recently read one of his books “How to Build a Multi-Level Money Machine.” I really enjoyed the book and overall I give it an 8 of 10. What I want to do in today’s post is share some of my favorite quotes from the book. Each quote is in bold and italics. At the end of each quote I will also provide my own two cents on the topic. The quotes are listed in no particular order. Enjoy. # 1 As long as you play the “trading time for money” game – you can never reach true financial security. Working for someone else or owning a traditional business only works if you have the ability to trade hours for dollars. The day you can no longer work, or no longer want to work is the day your income stops. # 2 You must become the creator of your own destiny. We are responsible for our own success or failure in life. Ultimately, we are the captain of our own battleship. # 3 Owning a traditional business can be more limiting than working for somebody! Most traditional business owners are slaves to their business, and in many cases they earn less than their employees do. # 4 A sales type is able to go out and retail a lot of product, but oftentimes he is not able to teach and train others. This is not a selling or recruiting business. This is a sponsoring and teaching business. Ideally, your job is to sponsor some new, teach them everything you know about the business, and help them become successful in the business. # 5 Your goal is to find an organization with a complete, duplicatable system to follow. You need a system that is simple, straightforward and easy for anyone to follow. Keep things cave man simple. The money is in the system. # 6 A system should completely delineate and spell out the entire process that a distributor will follow: from where to find prospects, to how to approach them, to how to sponsor them. To how to train them to reach the higher pin ranks. This one hits the nail on the head. The system should tell the new person exactly what to do. # 7 The reason a system is so important for you is that it ensures walkaway residual income. When you have a system in place – you no longer become essential to the process. This is the power of having a system: it replaces you. If your business solely relies on you, you don’t have a real business! # 8 How you bring in your people is how they will bring in their people. Whatever you do duplicates. Make sure that you have a simple way to sponsor and teach your new people. # 9 When you build with a system, once you secure a line, you can walk away and it will continue to grow. The only way to have walk away income in your business is if you have a system and leaders in place. # 10 Your dreams must be stronger than your fears! Motivation, positive thinking and hype will only last so long. Anyone can be excited for 30 to 90 days, and most people are. This business is not a lottery. Successful people must stay dedicated and focused for a period of YEARS before they become successful. # 11 When your dream is big enough, you will mold the universe to your will. You need to have a big dream or a big why. This is what will help keep you motivated during tough times and keep you in the game until you become successful. # 12 Success does not come overnight. Good things take time. Rome wasn’t built in a day. This business is not the lottery. If you’re looking to get rich quick, schedule a trip to Las Vegas. # 13 Consider your first six months a learning experience. When you first get started in the business, you are going back to school. I call it MLM School. This is where you will learn the ropes, so you can one day be successful. # 14 If your company has a product, you would never buy a competing product for any reason…ever! Be your own best customer. # 15 Present the whole program – business and products – and let the prospect decide. Talk to all of your prospects about the products and business opportunity so they can decide for themselves what is best for them. You never really know who will be interested in what. # 16 Functions are the glue that holds your business together. Get people to attend events whenever possible. Events will create massive growth in your business. # 17 Your business will grow only as fast as you grow. For your business to grow you must grow. # 18 “Lone rangers” can be successful initially – but will not enjoy long-term success. Plug in to your successful upline and don’t be a lone wolf. This is a team sport. # 19 One of the biggest mistakes people make in this business is thinking that sponsoring is a one-shot, all-or-nothing event. Most people will take multiple contacts before you sponsor them into the business. Many of your best distributors will take you months, even years to recruit. Your real job as a sponsor begins AFTER you have sponsored someone. # 20 In Network Marketing we are looking for people motivated enough to take action themselves. You can’t motivate someone permanently. Motivation comes from within. Your job is to find self-motivated people and help them succeed. # 21 We want to turn the distributors into leaders. Your job is to create an environment where you can teach your distributors how to become leaders and take responsibility for their own business. # 22 Your goal is to develop a customer for life. Customers are important in every business. Treat your customers like gold. Every distributor should have at least 10-20 retail customers, if not more. # 23 Every time the prospect sees the presentation – it should be a bigger “event” than the last one. Have a sponsoring process for your prospects. Walk them through a series of steps so they can make an educated decision about the business. # 24 When a couple views a presentation and makes a decision together…it’s one they’ll stick with. If your prospect is married or has a significant other, make sure you share the business presentation with both of them at once. Otherwise you are doing them an injustice. # 25 What you have to sell is freedom. Focus on the power of time freedom and residual income. That is something most of your prospects will be interested in. # 26 The expert is the guy from out of town. It’s hard to be a prophet in your own land. The people who know you best are the ones who are typically most critical of you. # 27 Your warm market is your best market. This business is best build through the warm market. # 28 Why don’t I take out ads in magazines and do mail-outs? And the answer is – because they work, but they don’t duplicate. The farther you get from the warm market, the more unduplicatable you become. Keep the business caveman simple. # 29 Because distributors are randomly placed under a sponsor – they have no respect for their sponsor’s skills, and thus don’t edify them. Keep everyone you personally sponsor on your first level in your organization. Help your people build depth, but don’t place your personally sponsored people under them. # 30 The reason that most people fail in networking is that they fail to identify and work with leaders. Leaders will produce most of your volume and most of your income. Distributors come and go, but leaders are the measuring stick for your long-term success in the industry. # 31 To succeed in networking, you must identify and work with your leaders, regardless of what level they are on. This is the only true method to secure lines. Work with the people who deserve your time, not the people who need your time. # 32 You must secure then build – secure then build. As you sponsor people you want to secure them by building tap-root legs in depth. This anchors people into the business because they have something to lose. Keep repeating that process over and over and never stop. # 33 The only true barometer of a line’s strength is the number of leaders in it who are following the system. Volume comes and goes. But leaders determine the stability of a leg. # 34 If you sponsor six people, two will do it now; two will do it later; and two will do it never. This business is a numbers game. Work the numbers and everything else will work itself out. # 35 Build a lot of width along with building the depth. Go wide and go deep. # 36 Your number one obligation in the business is to become successful yourself. You owe it to yourself and your team to become successful so you can show them the possibilities of the business and be rewarded for your time. # 37 You cannot show anyone how to attain a pin-rank until you attain that pin-rank yourself. You can’t teach something you haven’t done yourself. # 38 Your job is to work yourself out of a job. You want to replace yourself as quickly as possible. You want to train your people as quickly as possible so they are independent of you and know how to build a business of their own. # 39 The secret is keeping people in the system for two years. Keep your people plugged in to the system until they have enough belief in themselves (and the business) to make the decision to get started and commit. Some people will need to incubate for a while. # 40 Because most people no longer believe in their dreams, they insult, ridicule and beat down anyone who still does. Dream stealers are everywhere. Most people who have given up on themselves will try to bring you down to their level. # 41 The prime time for the business is evenings from 7:00 to 10:00 pm. Most of your prospects and most of the people in your team have a day job. Most of these folks will work their business in the evenings, or be available for a conversation in the evenings. Make sure you build your business at night, when people are available. # 42 My experience is that once you have 35 to 50 core leaders in a line – that line is absolutely one hundred percent secure for life. Build two or three good lines with 35 to 50 leaders in each line and you will have a huge team. # 43 Your local lines should be your primary sources of income. Start locally and let your business expand from there. # 44 Your long distance lines are your strongest ones. When you sponsor people who live far away from you, they are forced to take ownership of their own business, and do things that your local people would normally have you do for them. Your best lines will be your long distance lines. # 45 I believe every person in the world has the ability to create a massive Network Marketing organization. Yet, I also believe that most people never will. The opportunity is there for anyone to take, but few people have the desire, work ethic and commitment to make it work. # 46 Every leader I spoke with had a different way of doing business. Some held meetings; some built by mail; others only did one-on-ones; and yet some concentrated mostly on retail. We all have different natural talents and abilities. Successful distributors leverage their own talents and abilities to build the business in a way that works for them. # 47 Listening and being coachable are the first steps to success in this business. Humble yourself and follow your sponsor’s lead, especially if they know what they are doing. # 48 Your company, and even the industry, are not the opportunity. You are. Your success is totally up to you. You can succeed or fail in any company. # 49 Most people will benefit from the products; some will benefit from the personal growth; and the serious ones will become wealthy. Figure out what the other person wants and show them how to get it. Everyone has different desires, dreams and goals. Most people do not want to make the big bucks. # 50 The only obstacles that can stop you are the ones you see in the mirror every morning. You can be your own greatest asset or your own worst enemy. # 51 Invest in a commitment. Commitment is what will keep you going. No one is motivated every day. But if you stay committed and stay the course you will eventually succeed. In other words, commitment is more important than motivation. # 52 Don’t ever use your kids as an excuse not to do the business. If anything your kids should be a reason WHY you build your business. # 53 If you don’t invest in you – who will? Invest in your personal growth. Focus on incremental growth. For your business to grow you must grow. # 54 Network Marketing works on the principle of delayed gratification. It takes time to build a profitable business of any kind. If you need immediate income, get a job. This is a business. You are building an asset. You might work for 2-3 years without seeing a return on your investment. Good things take time. # 55 Set the example for your group. Lead by example at all times. People will do what you do, not what you tell them to do. How to Build a Multi-Level Money Machine is now in its 4th edition. The 4th edition was published on June 1, 2009. It is published by Prime Concepts Group. The book has 300 pages. The ISBN is 978-0967316444. It sells for $17 on Amazon. As of May 4, 2015 the book has six reviews on Amazon with an average 4.7 star rating. The review I did on this page was for a previous edition. In summary, “How to Build a Multi-Level Money Machine” by Randy Gage is a great book. It’s loaded with great tips and nuggets by a guy who has been there and done that. It’s well written, easy to read and would be a great addition to your personal library. If you haven’t read it yet, you should. What are thoughts? What is your favorite quote on this page? What did you think about the book? Leave a comment below to let me know what you think. I look forward to hearing from you. I wanted to also put in another thing I see in #26. I agree that most people who know us are most critical of us. I also think that what Randy may have meant by this is: by being far from their sponsor, a person in another town will work harder and become more ingrained in the MLM. This is because they don’t have someone there holding their hand. Randy Gage has a plethora of great information in this book. It should be a must have for all network marketers. Great review Chuck. Thanks. Building local is a great way to get started, but long distance legs typically do the best because you aren’t there to babysit them. Your dreams and self-motivation definitely do have to be bigger than your fears. That’s not to say you won’t have fears, because that is a normal part of progression. However, your fears should not limit you. I remember someone once telling me that if you are afraid of something it is a pretty good indication that you should do it. Fears are what happen right on the verge of success normally, so if anything they should motivate you rather than hold you back. Number 45 is true and a real hard hitter when you think about it. Why will most people not do this? They let everyone else get in their way! A friend of mine told me to pick this book up before and after reading this I will have to hop on Amazon and get me a copy. Most people expect more from their business than they are actually willing to put in for work themselves. The main reason I am regular follower of your blog is such book reviews you are posting. I am a bookish guy, I read average 20 hours per week and I read almost every genre except fiction. Please write more and more book reviews. Love from India. Glad you like my book reviews. You always seem to recommend the best books! This is yet another one that I have added to my list. I can’t wait to read stand see for myself just how great it is. As always, thank you for sharing! Glad I could help. Randy’s book is a good one. The guy is a stud. I really like quote #10. In many cases, our fears hold us back from success. In most cases, the fears are usually unfounded. If we get past those fears, we are many steps closer to finding success. Thank you for this great review Charles.